Bagging it Written on February 9, 2009, by Ingeborg. Most Dutch people bring a shopping bag. A deposit for plastic bags has been introduced ages ago. I am all for making less consuming attractive and fun. 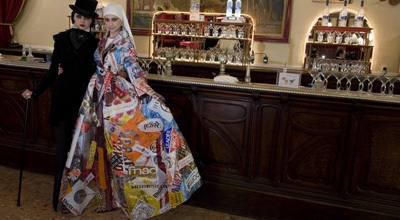 French couturier Franck Sorbier has made a beautiful statement showing plastic bags are worth keeping. Outfit Mother Teresa is part of his autumn/winter 2008-2009 fashion presentation. Read more from the Superuse category. Stay up to date via RSS , or Trackback from your site.